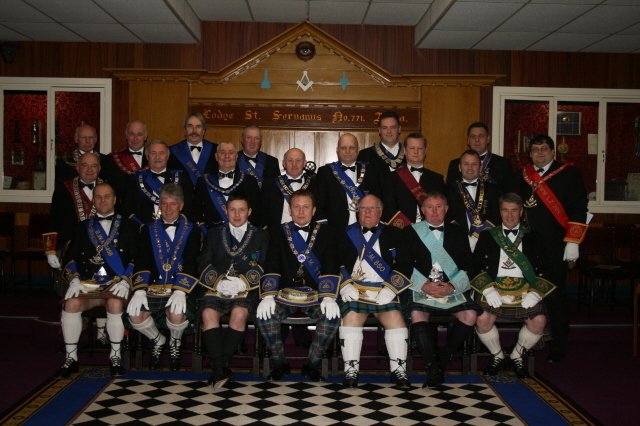 The Annual Reigning Masters Degree this year was held in Lodge St Servanus No 771 Alva on the 4th April. The main guest this year was the Provincial Grand Master of Lanarkshire Upper Ward Bro William Landsborough, Grand Secretary Bro David Begg was also in attendance. A large attendance of Brethren, both from within and outwith the Province, witnessed a very fine first degree conferred on Bro Peter Boyle. The R.W. Master of the host Lodge, Lodge St Servanus No 771, Bro Craig O’Connor, was in the chair and every Master of the Lodges within the Province had a part to play and as per normal the gelled together so that on the evening their degree work was the best. The thanks of the Province goes to the Right Worshipful Master, Office Bearers, and Brethren of 771, not only for the use of the premises but for all the assistance given and catering provided by them, it was greatly appreciated. All the money raised this year from the Reigning Masters Degree was donated to Fairfield School in Alloa. And on Wednesday 11th June 2008 several Masters and Provincial Office Bearers attended Fairfield School where the Provincial Grand Master Bro John McKenzie presented a cheque for £1000 to the head teacher Christina Paterson. During the visit several of the pupils asked if the money would buy footballs. 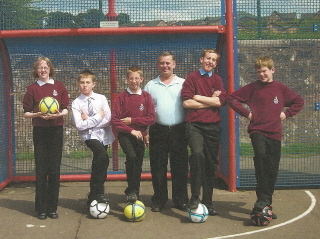 This not being a certainty Brother McKenzie purchased a number of footballs and they were also presented to the school by Brother Allan Leishman of behalf of John. Pictured below is Brother Leishman with a number of the pupils. Can't see Allan chasing the balls.